The young generation is setting new standards for many traditional industries. According to a representative survey of 1,000 German consumers commissioned by PwC, people under 30 have high expectations of their shopping experience. As a fact, they are the drivers of digitization and individualization in a new market environment. For many traditional industries, including the cinema industry, digital services are not yet an essential part of the shopping experience. However, for the younger generation, they are already highly relevant today. Hence, cinemas need to rethink their pricing strategy. Theatre owners are in need to adapt to the changing purchase behavior. Otherwise they might lose touch with the major consumer group of tomorrow. The shopping and money-spending behavior of the younger generation is changing. However, new trends are also visible for movie consumption preference. A study from 2017 by GfK Media Scope on the German cinema market revealed that younger movie-goers prefer to go to theaters on weekend rather than during the week. Furthermore, data shows that the life cycle of movies is getting shorter. Hence, more revenue is created during the release week of new movies. Lastly, competition from online movie streaming services, such as Netflix, are threatening the profitability of traditional cinemas. These patterns can also be seen in other European and international cinema markets. The question is how exhibitors might reverse this trend and make cinemas attractive again for millennials. A wide variety of alternatives in the form of movie streaming services threaten cinemas. Also, new competition in other forms of entertainment is arising. Many millennials consider going to the theater more often when premium features are offered. That way, they can enjoy the unique movie experience. This highlights the need for exhibitors to invest in theatrical experiences that include premium features like large, comfortable chairs, immersive sound, large-format screens, as well as reserved and personalized ticketing. The easier step for most exhibitors might be implementing new product features for a better movie experience. The tricky part is finding the right strategy to price the new features. Understand the audience well enough to know what are the optimal price points for movie tickets are is the key for exhibitors. If tickets are priced too high, cinemas risk a poor attendance in theaters. On the other hand, low tickets might not even cover the costs. In an ideal situation, an exhibitor knows exactly how many people will attend the movie. Also, what premium features will be used. This way, they can price accordingly to the demand and find the right ticket price for each customer. While this seems to be unachievable, today’s data science can already predict the attendance in theatres, based on hundreds of factors that drive demand. Those facotrs are movie life cycle, movie popularity, theater location, weather, and many more. 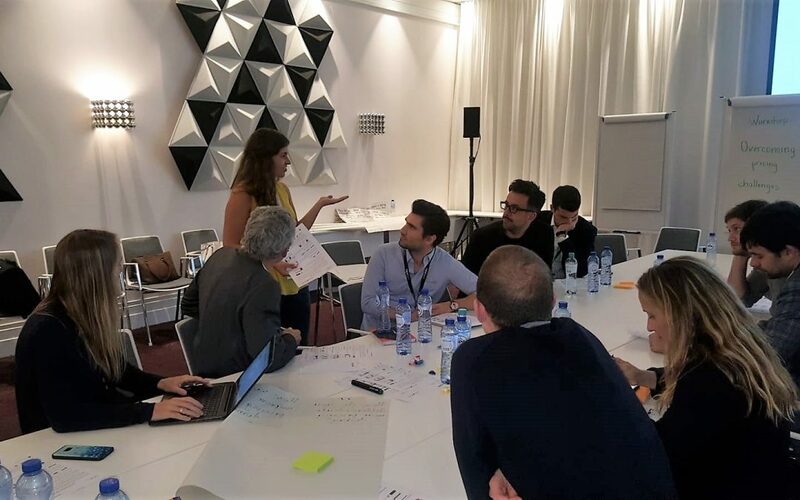 The topic of best pricing strategies in cinemas was the focus at the workshop by Smart Pricer during the UNIC cinema days 2018 in Brussels. The UNIC Cinema Days serve as a key platform for senior executives and key figures from across Europa. This event traditionally provides an opportunity to discuss the latest trends in the cinema business in an informal environment. Christian Kluge and Gergana Ivanova from Smart Pricer have carried out the workshop “Overcoming pricing challenges”. The focus of the workshop was to analyze current pricing models in cinemas. Furthermore, they discussed the obstacles that prevent an implementation of new pricing methods. The efforts are driven by the aim to attract a younger audience and offer more flexible ticket prices for visitor’s convenience. The attendees faced questions about their current pricing strategy. It was revealed that the majority of exhibitors admit to use the prices of nearby cinemas to determining own movie ticket prices. Nevertheöess, almost all cinemas offer some kind of price differentiation for their customers. 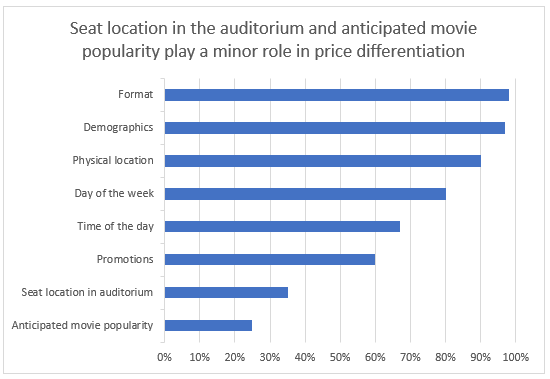 A survey on the most common price differentiations in the theaters revealed, that prices differ by movie format, demographics, physical location, and day of the week. However, less differentiation takes place in more specific demand-impacting factors, such as time of the day, promotions, seat location in the auditorium, and anticipated movie popularity (Exhibit 2). We learned that many young movie-goers would prefer a highly customized cinema experiences. As a result, it becomes clear that exhibitors are missing the opportunity to differentiate products and align prices accordingly. Around 89% of the exhibitors think that there is a potential for improving the current cinemas pricing strategy. Hence, the majority is aware that there is more potential in a better pricing for their overall business performance. 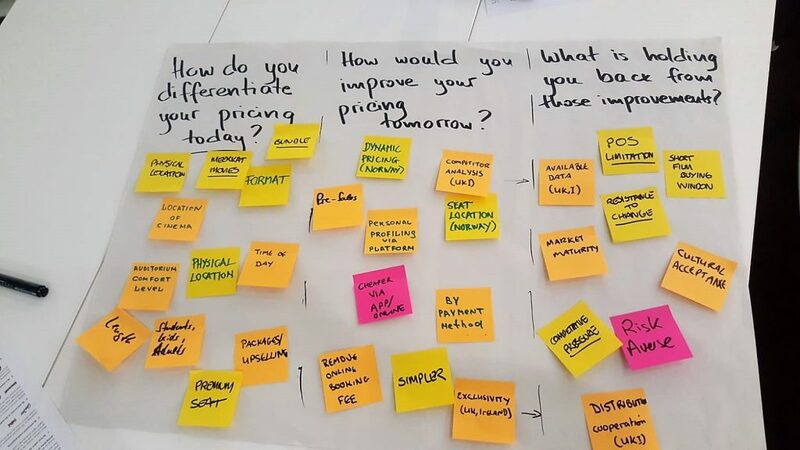 After all, the major idea of a new and more flexible pricing strategy is to give customers the choice of different product segments. This way, exhibitors can skim the willingness to pay of each customer segment. First of all, it is important to communicate every price change transparently to customers. Visitors generally accept changes when the rules of different price segments are shown openly. So, they evaluate the best price segment and features they like most. Removing online booking fees incentivize online sales. This benefits cinemas to reduce the cost of selling tickets at the box office and gather valuable data from their customers on their website. Behavioral data on the website offers more personalized marketing campaigns, while Social Media and Newsletter are tools to stay in touch with customers. Discounts on pre-sale are rewarding early-birds who give up flexibility. The discounts lead to more pre-sales and in return give cinemas a better planning security on how many people might come and how many staff they are needing. Weather-based pricing is quite popular for out-door entertainment providers, who offer discounts on days with bad weather to drive demand. Cinemas can use weather-based pricing for their strategy, as bad weather is more likely to attract people into cinemas than nice weather. Demand-based pricing is the highest form of price optimization. Tickets for movies change over time, based on the expected demand for each show and the number of tickets already sold. This strategy is well-known in the airline and hospitality industry. The results show that most exhibitors are open to a dynamic pricing model. However, the majority doesn’t know how to implement dynamic pricing effectively or have the data analysis tools at hand to start the process. Many cinemas are concerned about the influence of competitors on their own strategy. New pricing strategies would disrupt the balance. Furthermore, the IT-systems are often quite slow to respond to the changes required with dynamic pricing. Another obstacle is the regulations and legalities set by the distributors. Secondly, exhibitors fear that the market might not be ready for advanced and complex changes in pricing. Nobody wants to be the first to take the risk and change the pricing strategy. The risk of losing the image and reputation is seen as too high. Lastly, exhibitors are concerned that cinema is a traditional industry and customers do not always accept new models. New flexible pricing could lead to a bad customer perception and probably to bad press as well. The main challenges are the fear of the unknown and problems with IT implementation. Attendees understood that the solution has to base on data instead of gut feeling and assumptions. After all, the consumer behavior is shifting and cinemas have to adapt to stay in the game. Most exhibitors agree, that this is the way to go in the future and are looking forward to elaborating more on the topic. A detailed data analysis of internal and external factors influencing the demand for movie-goers provides the comfortable situation of setting up prices that really reflect the customer’s willingness to pay. This makes pricing the competitive advantage of cinemas, rather than a challenge. Smart Pricer’s team of pricing experts provides cinemas, sports clubs, entertainment venues, and ski resorts around the globe with the necessary tools to increase ticketing revenues and attract more visitors. With over 10 years of airline pricing experience and millions of price optimizations, Smart Pricer is the go-to-partner for companies such as Europe’s largest cinema chain Odeon-UCI, Berlin’s Bundesliga club, Hertha BSC and Swiss ski lift provider Zermatt Bergbahnen AG. Smart Pricer continues to help companies achieve an increase in ticketing revenues by +5-15% while enhancing visitor satisfaction. Dynamic ticket pricing gives the consumer the ability to purchase film tickets at a wider range of prices. This depends on a number of demand variables, such as movie life cycle, time of day, day of the week, film title, venue, size of screen, actual bookings and several more. The number of seats in each price category for every film is based on demand conditions at the time of purchase. Please head over to our cinema page to discover all solutions we provide in this industry.